Behind every great lead singer, there’s an even greater drummer. This seems to be part of the point made by Hit So Hard, a documentary about the openly lesbian drummer of grunge band Hole, Patty Schemel. 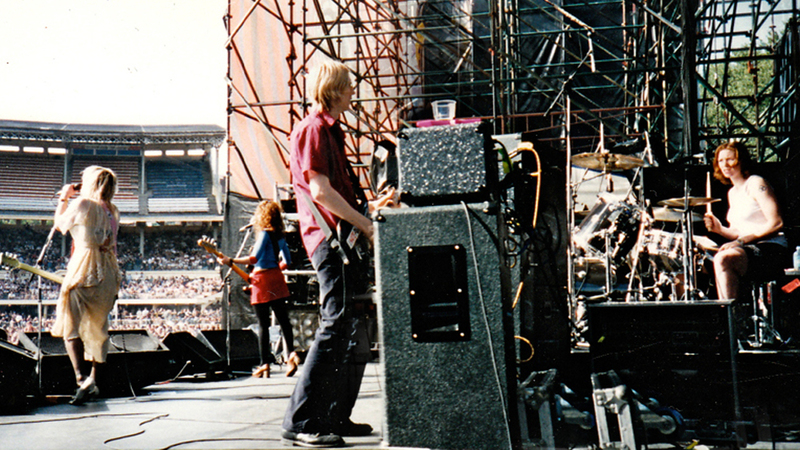 Now, whilst there’s no denying the influence of all the members of Hole on the band and their sound, the promoters of the film and the self-confessed Hole fan who introduced the film at the BFI 26th London Lesbian & Gay Film Festival, seem to be inferring that Hit So Hard shows Patty as the heart of the band, and that it’s her soul you can hear running through the songs, in spite of Courtney Love’s declaration that, “like it’s Trent Reznors Nine Inch Nails, it’s Courtney Love’s Hole”. In fact, one of the things Hit So Hard does so well is to show the unity Hole had as a band, something that the media would have us believe didn’t exist. Hole were the perfect Grunge band, with a kickass lesbian drummer, a kickass female bassist, the token guy who was a kickass guitarist, and Courtney Love, the epitome of a rock’n’roll front woman. Like every good lead singer, Courtney’s wild and uncontrolled public image and stage persona meant that, as the focal point of the band, she became to represent what the public understood the band to be – so if they disliked Courtney, they disliked Hole. It’s interesting then that P. David Ebersole made a conscious decision not to paint Patty more favourably than Courtney, but rather to honestly portray her as the intelligent and important artist she is. Hole was my first foray into alternative music. Celebrity Skin (ironically one of the several Hole albums Patty didn’t play on and the one that caused her exit from the band) changed my life. I remember renting it from my local library on CD, along with Antichrist Superstar by Marilyn Manson, and terrorising my parents with both of them on a regular basis. I had the title track, along with b-side ‘Best Sunday Dress’, on cassette single and took it to my friends house to play over and over again on her ghetto blaster in her living room. Live Through This is one of a handful of albums that define grunge (including In Utero by Nirvana and Ten by Pearl Jam). As much as her critics (including Dave Grohl) have spent years trying to discredit Courtney and Hole, Courtney is a very important figure in rock music. And it’s with this mind that I lapped up every grainy second of Hit So Hard like a very, very thirsty puppy. Alongside the candid footage of her career are the interviews conducted by Ebersole, after acquiring the footage in 2007, and it’s these conversations that really help you understand Patty’s story. Emotional interviews with her mother, her brother and Patty herself, take us on a journey through her life charting her first alcoholic drink at the age of 12, the drug addiction and dependency that nearly killed her, through to the present, post-recovery. Like so many of her contemporaries, at her lowest point she was smack bang in the middle of her Saturn’s Return, the so-called sink or swim period of your life that happens between the ages of 27 and 30, a time when some of your biggest life changes occur. 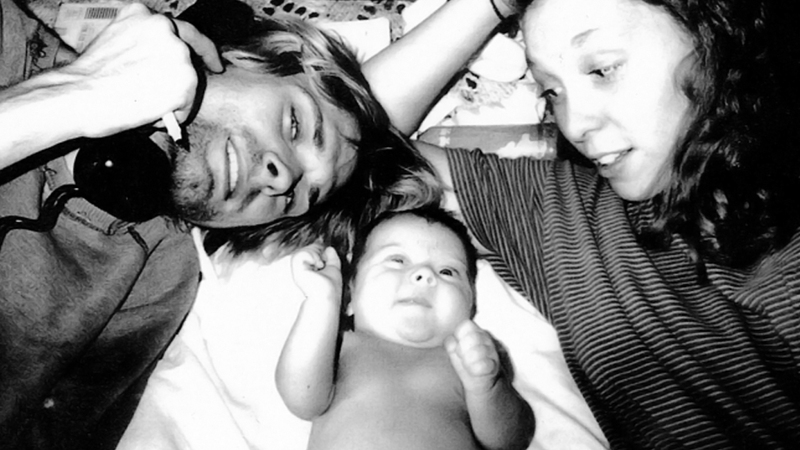 Kurt died at 27, and many people thought Patty would go the same way. This is an engaging film from start to finish, made with raw materials and edited in a matter of fact style that only enhances the story behind the footage. It’s as much a film about Kurt and Courtney as it is about Patty, giving us an insight into a couple who’s seemingly turbulent relationship has lead to many unsubstantiated accusations of murder since Kurt’s death in 1994. Seeing the home video footage of them left no doubt in my mind that their relationship was one drenched in love, and that Kurt was a loving and giving father before his death. If ever there was a way to capture grunge, and to capture addiction, this is it. But the film has a very powerful message: swim or drown. Somehow Patty swam and her story is proof that even at your lowest it is possible to turn your life around. There is much to say about this film, but such commentary would be ‘spoilers’ and could potentially ruin the experience of seeing it. I would urge anyone with an interest in popular music over the past 20 years to watch it; it’s a small part of the tapestry of the music industry today that can’t be ignored. I will leave you with this tempting snippet: look out for the footage of Courtney, with no makeup, sat on her bed playing on an acoustic guitar an unreleased song titled ‘Stink Of You’, while Kurt harmonises in the background. That scene alone is a slice of Rock’n’Roll history that will be forever burned into my mind.